A previous post about A Duke in Shining Armor described my husband and my tracking Olympia’s escape route. This time I thought it would be fun to take a closer look at the house she ran from, Newland House. Seeking a wedding locale near but not in 1830s London, I discovered Campden House on a map of Kensington. It belongs to one of many areas that are now part of London but were rural retreats then. An online search turned up black and white engravings of a Jacobean mansion built more or less in the style of Holland House (more on that here, here, and here). That is to say, it had towers and turrets and lots of windows, and sprawled with a pleasing untidiness over a large estate. Because I intended to send my characters southwestward, its location was ideal: between Holland Park and Kensington Gardens, and a short distance from the Kensington High Street, where Olympia and Ripley would find a hackney stand. Like other great houses, Campden House went through a series of transformations. These are described in Chapter IV of Kensington Picturesque and Historical, and explains my mentioning Queen Anne in my story. The chapter, which includes a rather poignant account of the queen’s one surviving son, describes the house’s interior, the 1862 fire*, and the rebuilding some years later. The second incarnation was demolished at the turn of the 20th century. Campden House c. 1860, south-east view from the garden. Coloured litho by Edwin Smith. But once again, though the book was completed, I still wanted to know more. Shortly after tracing Olympia’s route, my husband and I went to the Kensington Central Library, where Dave Walker, archivist/librarian/blogger, generously supplied mountains of material from the archives, and helped us—my husband, actually—scan and photograph dozens of images, including one describing the house’s location: “Old Campden House and its ground stood approximately within the square formed by the Sheffield Terrace (on the north) + Campden House Road (on the west) Gloucester Walk (on the south) and Church Street (on the east).” This helped us get our bearings. “This photograph from the early 1900s shows the remains of tower that stood in the grounds of Campden House.“— Library Time Machine. As many of you know, I have as much fun doing historical research as creating the story. One feeds the other. A Duke in Shining Armor inspired other investigations, as did my visit with Dave Walker. These in turn have inspired scenes in my work-in-slow-progress. You can expect more nerdy history material in the months to come. Following are some of my sources, in case you’d like to delve more deeply into the history. More about Campden House , with a detailed description of the Pitt estate, at British History online. 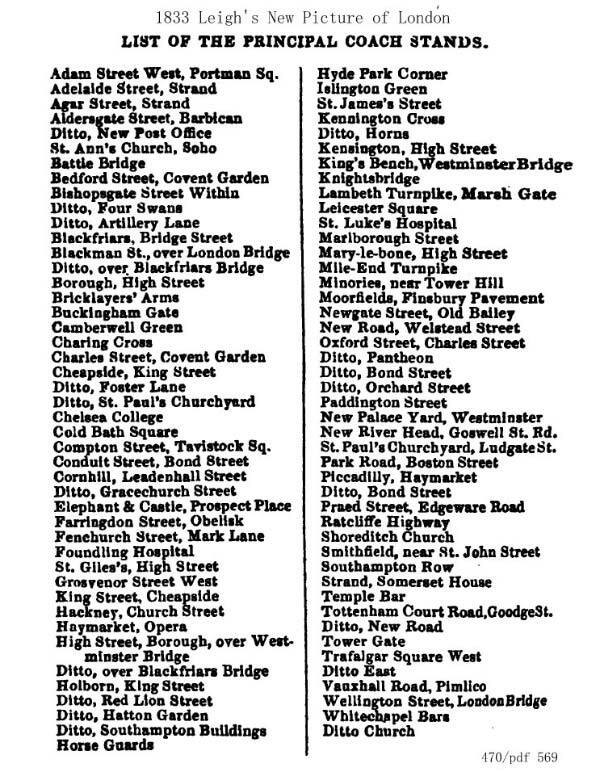 Description from The Old Court Suburbs: Kensington, in Old Kensington, in Old and New London: Volume 5. Campden House after the fire. Interiors are scarce. This is the schoolroom at Campden House, coloured lithograph by Charles Richardson. You can find the house on this 1841 map of Kensington & Chelsea. Here at Mapco is a Victorian era (some 30 years later) map segment you can enlarge considerably. By this time the area is considerably more populated. *A better account of the fire begins here on page 773 of Chambers’s Journal, Sixth Series, Vol X December 1906 to November 1907. The photographs, including those of materials from the Kensington Central Library, are the work of Walter M. Henritze III. Our thanks to Dave Walker and Isabel Hernandez for giving so generously of their time, for sharing so much fascinating material, and for their patience. My historical romances feature quite a few duke heroes, all rich, young, and good-looking. This was not the reality in early 19th century Great Britain and it isn’t the reality today. What is real though, is their belonging to the highest rank of the peerage, and their possessing, in the time of our stories, power, privilege, and wealth we can scarcely imagine. The duke is the mightiest of the noblemen—but in the idealized world of romance fiction, he meets his match in the strong heroine, who may have nothing but her brains to depend on. So, I’m OK with the jillion fictional dukes. The clothes, however, need to be correct (see my post on 1830s clothing). The streets need to be correct. And the houses. And other stuff. This is to make the story feel real. The characters are make-believe, but I place them in a world as close to historical reality as I can make it. Which isn’t to say I don’t take artistic liberties from time to time, or avoid many of the less appealing aspects of the time. It’s a historical romance, not a biography or history. All the same, if the opportunity arises, I check my work, even after the book’s been published. Because of my brain. This happened with the Venice I described in Your Scandalous Ways. Though I traveled there well after the book was released, I visited the story’s various locations, to make sure I’d imagined correctly. I had. But that was Venice. If Lord Byron came back from the dead and visited, he’d recognize the place. But London? He’d feel the way I did when I visited Tirana, Albania, after several decades: Where am I? More to the point, Where did all these buildings and cars and things come from? Help! What is this place? As you’d expect, then, when I was in London—after A Duke in Shining Armor had gone into production and it was too late to change anything—I had to make sure I’d got things right. Thus, Olympia and Ripley’s great escape from her uncle’s house in Kensington? That run down Horton Street to the cab stand? Yes, I followed their route, to make sure it made sense and the timing worked. The house she ran from, Newland House, was based on Campden House. It’s long gone (more about that on another post). But I knew approximately where it had stood—or sprawled, rather, over a large property. And, this being London (Kensington, to be precise), I found equivalents of the various landmarks I’d pictured. There was, as described, a tall wall around a large property. 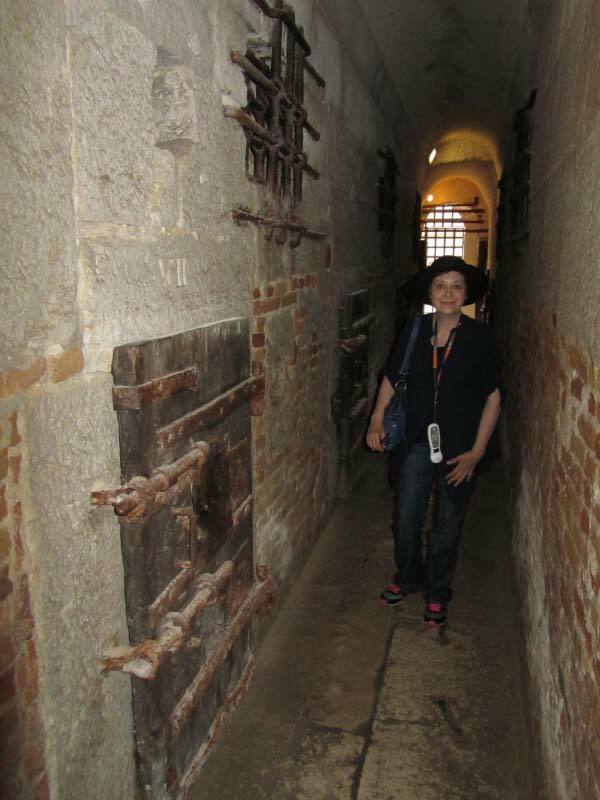 There was, as described, a locked gate in the wall. And I found these features in the general area where the garden of the house would have been. And there was Horton Street. As the map shows, Kensington was much more rural in 1833. A great many more buildings line Horton Street now than in the time of my story. But the street, unlike some others, remains, as do other landmarks. And lo and behold, when we reached the Kensington High Street, we came upon a cab stand, about where there had been one at the time of my story. Maybe exactly where it had been, because that is one of the marvelous things about London: If you look, you find the past, maybe where you least expect it. And some things don’t change all that much. Image of Campden House courtesy Kensington Central Library, with special thanks to Dave Walker and Isabel Hernandez for their patience and help. Sometimes inspiration comes from weather. On 10 February 1840, Queen Victoria married Prince Albert of Saxe-Coburg and Gotha. The rotten weather on the previous day stuck in my mind. I pictured a soaking wet, deeply angry (and hurt) nobleman, banging on the door of a house. And so began “The Jilting of Lord Rothwick,” one of two short stories in my Royally Ever After collection. Among other things, the contemporary descriptions taught me that royal wedding frenzy, and the media’s eagerness to report all minutiae relating thereto, is by no means a modern development. on which were to be celebrated the nuptials of our maiden Sovereign and Prince Albert of Saxe Coburg. Yes, multitudes turned out for the big day. 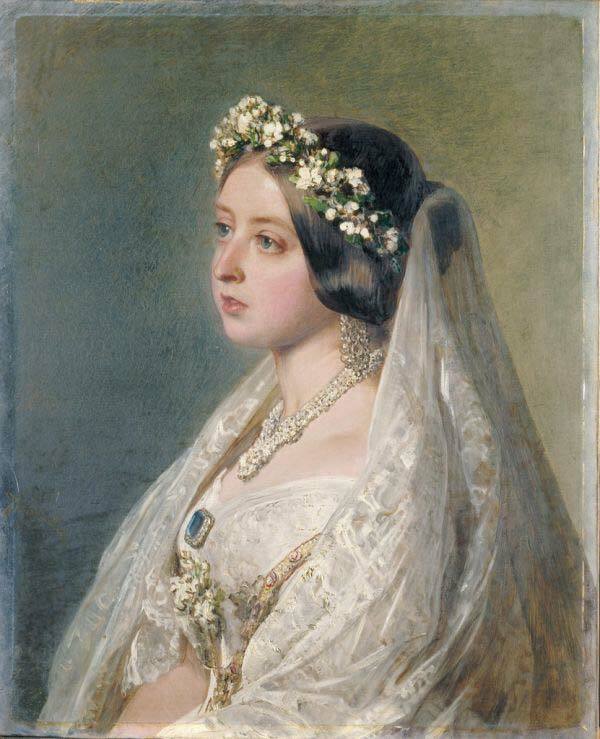 As the above fashion plates make clear, Queen Victoria was not, as many believe, the first bride to wear a white wedding dress. But she was apparently the first royal to wear white, like other brides, instead of silver, and she left off the ceremonial robes befitting a monarch. Still, she did start a fashion for BIG royal weddings. Previously, these had been relatively private affairs. But then, hers was a big deal—the first wedding of a reigning queen since Queen Mary in 1554. The wedding cake was a big deal, too. This page offers closeups of the details, including the curious Roman attire described below. 5. THE ROYAL WEDDING CAKE. —A select few have been gratified with a sight of the royal wedding cake at the apartments of the confectionary in St. James's palace, but it is described as consisting of the most exquisite compounds of all the rich things with which the most expensive cakes can be composed, mingled and mixed together into delightful harmony by the most elaborate science of the confectioner. This royal cake weighs nearly 300 lb. weight. It is three yards in circumference, and about fourteen inches in depth or thickness. It is covered with sugar of the purest white; on the top is seen the figure of Britannia in the act of blessing the illustrious bride and bridegroom, who are dressed somewhat incongruously in the costume of ancient Rome. These figures are not quite a foot in height; at the feet of his serene highness is the effigy of a dog, said to denote fidelity; and at the feet of the queen is a pair of turtle doves, denoting the felicities of the marriage state. A cupid is writing in a volume expanded on his knees the date of the day of the marriage, and various other cupids are sporting and enjoying themselves as such interesting little individuals generally do. These little figures are well modelled. On the top of the cake are numerous bouquets of white flowers tied with true lovers' knots of white satin riband, intended for presents to the guests at the nuptial breakfast. This elegant emblem of the felicities of marriage will be placed on the breakfast table of the queen at Buckingham palace at the breakfast which is to succeed the ceremonies in the chapel royal.”—Annual Register 1840 (its description of the wedding begins on the following page). Illustrations: Franz Xaver Winterhalter, Queen Victoria, in her wedding dress and veil from 1840, painted in 1847 as an anniversary gift for her husband, Prince Albert. Original painting owned by the Royal Collection. Source of photograph unknown. The Marriage of Queen Victoria, 10 February 1840, painted by George Hayter 1840-1842. Royal Collection RCIN 407165, via Wikipedia. Wedding invitation, from tiaras and trianon. And in case you were wondering: The photographs posted on the tiaras and trianon page were not taken at the wedding, but at a re-creation some years later. Clicking on the image will enlarge it. Clicking on the caption will take you to the source, where you can learn more and enlarge images as needed. A funny thing has happened in terms of my historical setting. 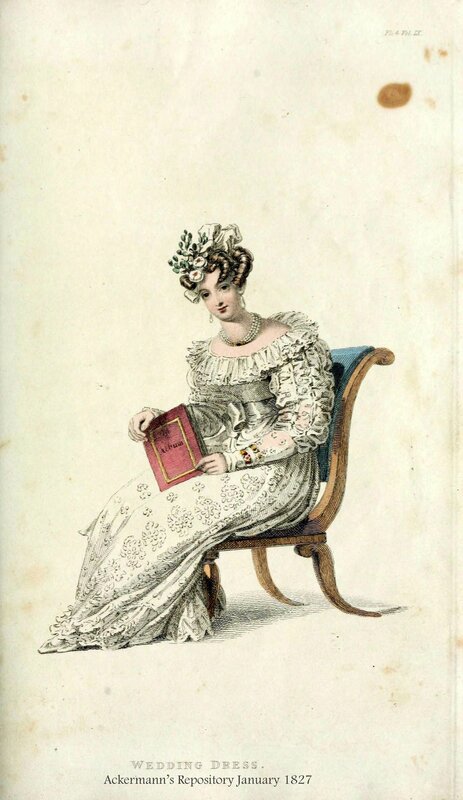 From the last Carsington book (Last Night’s Scandal) on, I’ve been setting my stories in the 1830s, when clothes looked very, very different from those we associate with the Regency era and Pride and Prejudice. Below are a few fashion plates displaying the vertical style of the Regency. Many people find 1830s styles ridiculous, even hideous, but I love them because they are so flamboyant and inventive and over-the-top. I especially love this era’s fashion because it’s so complicated to put on and take off, which makes for interesting intimate scenes between hero and heroine. Mainly we see historical dress in fashion plates, where it does look cartoonish, as fashion plates tend to do. Then as now, the images are stylized. For instance, the pelerines and canazous look like stiff white capes jutting out over the dresses’ enormous sleeves. The images below are from the Los Angeles Public Library Casey Fashion Plates collection. We can get a better sense of the clothing in portraits, like this one. But in portraits, people are posed. The fabric may drape beautifully, but everything is frozen. Images in museums show the clothing on mannequins, often headless. Sometimes there’s no mannequin, only the dress. Rarely do we see an entire ensemble. So imagine my excitement recently to discover, thanks to author Susan Holloway Scott, that a group of historical dressmakers and re-enactors have turned their dressmaking skills to recreating 1830s fashions. I can tell you it’s already made a difference in how I’ve handled the most recent occasion of the hero getting his hands on the heroine. In case you were curious about 1830s corsets, here’s a video. This blog post deals with making and adorning an 1830s dress. A group of talented dressmakers invade the Dickens Fair in 1830s fashions. And this 1833 dress is from about time of my Difficult Dukes series. The following is an expanded version of a blog post that appeared at Two Nerdy History Girls. 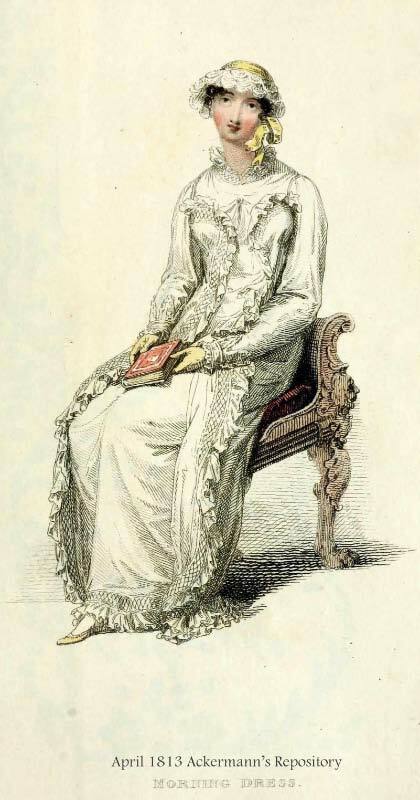 1833 Bridal Ensemble that appeared in several ladies' magazines. This is what Olympia wore. There was a time when blonde lace was ubiquitous, as we learn if we look at ladies’ attire for court events. Certain magazines listed not only the attendees but also what they wore. For example, if you type “blonde” into the search box for this 1831 Royal Lady’s Magazine, you will notice that nearly every single lady wore blonde or blonde lace to the Queen’s Drawing Rooms. This is why blonde lace features in so many of my 1830s-set books. However, the term “blonde” can be a little puzzling when we’re confronted with a description referring to “black blonde,” as happens in A Duke in Shining Armor. Blonde lace is a silk bobbin lace. A search on YouTube will show it being made, and give you an idea why the handmade version was so very expensive and highly prized. The “blonde” part refers to the silk’s natural color, which was ecru. Once a way was found to make the silk stronger, it could be lightened, for a white blonde, and dyed, for black blonde. Still, terminology can be confusing. “Next to Chantilly the blondes are the most important among the silk laces.” Yet elsewhere we’re told that Chantilly is a blonde lace. My impression is, the blonde made in Chantilly was considered superior. Any textile experts reading this are invited to provide further enlightenment. These fine details, however, don’t seem to be crucial to the magazines, and definitely aren’t crucial for my books. For the purposes of A Duke in Shining Armor in particular, what you’d probably rather see are examples. However, I do think portraits capture the look of the lace much better than the stiff, stylized fashion prints. The gallery below shows some examples of each. Images: Queen Adelaide (consort of King William IV) by Sir William Beechey, courtesy National Portrait Gallery NPG 1533; Court Dress for May 1831; Countess Julie von Woyna by Friedrich von Amerling 1832; Court Dress for April 1832; Giovannia Pacini (eldest daughter of the Italian composer Giovanni Pacini) 1831. The two examples of court dress give you an idea of just how much blonde lace was involved. The feathers and the lace lappets were a particular feature of court dress. You can see a sample of Belgian Bobbin Lace in this lappet. And here is a sample of French Pillow-made Silk Blonde. And this is an image of a lady in what seems to be black lace. Subscribe to Loretta's blog via email and get new posts sent to your inbox. You can also find some of Loretta’s past writing about history and her work over in the archives of the Two Nerdy History Girls blog. "The Jilting of Lord Northwick"